The road and railway modules consist of 2 main parts; the emission calculation and the propagation calculation. The emission calculation is always performed inside the Geo-Database where the vehicle numbers for various vehicle categories, the speed of the vehicles, and the road/rail surfaces are fed into a calculation that results in the emission level. The emission level can be the sound power or a sound pressure level in a given reference distance from the road/rail. Emissions are calculated for every section of the road/rail. 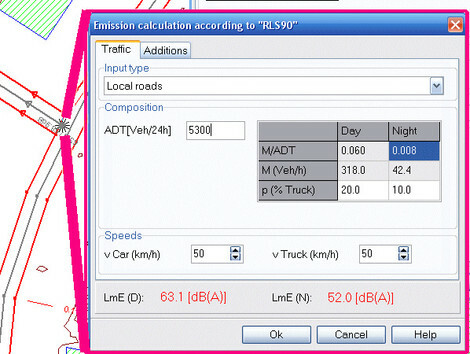 Where conditions change in traffic speed, volume or surface type, a new emission value is computed. The propagation calculation is executed inside the Calculation Core. 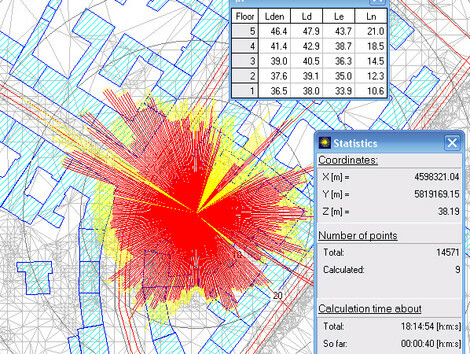 Calculations can be performed for single receivers or various types of noise maps (Grid Noise Map, Façade Noise Map, Triangulated Noise Map, Horizontal Noise Map). The results from the calculations can be documented in the Documentation, Spreadsheet and in the Graphics. See these topics for details. TNM is not tested or endorsed in any way by the US Department of Transport. Click here to learn more about the SoundPLAN road noise module. The results from the road noise calculations can be adjusted to your needs. 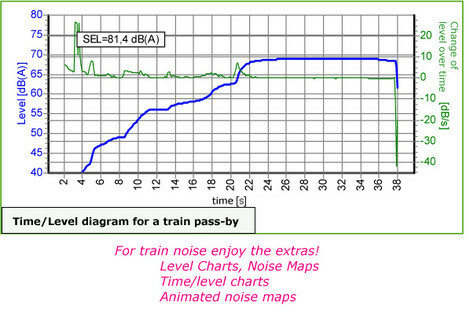 In the Noise Assessment, the user defines how the noise levels will be presented; as the sound pressure level during a certain time period or as a post processed value, as Leq or as Lmax, without adjustments as the Lday / Lnight or with adjustments to form the Lden where the 24 hour time average is taken with the evening period increased by 5 dB and the night period increased by 10 dB. The Assessment Library that defines a number of standard cases can be user amended to reflect the noise descriptor used in your area. When mapping road and railway noise where very many sources are evaluated over very large areas, the number of source/receiver combinations that needs to be evaluated can be so high that a single personal computer sometimes would run for weeks. To decrease the calculation time, use all the computer resources available in your office. One SoundPLAN module, Distributed Computing, allows you to harness as many PCs as you wish. When you do calculations, no special preparation of the model or data is required. 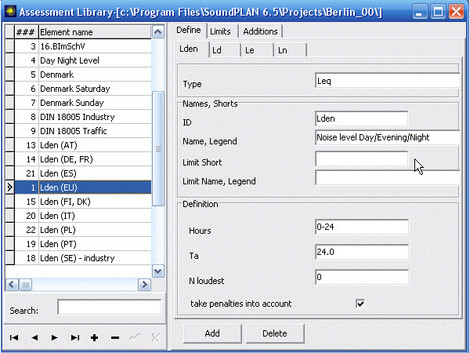 After the Distributed Computing (DC) system is installed, locate other office computers that are SoundPLAN DC enabled and sitting idle, and with a click of the mouse, run distributed computations on all of the selected PCs with minimal overhead. There is no script to write, no directories to establish and no work involved assembling the results into a consistent result file. No reviews were found for SoundPLAN - Noise Mapping for Road / Railway / Distributed Computing Module. Be the first to review!